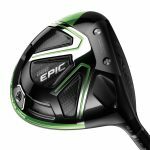 CARLSBAD, Calif., January 4, 2017 — Callaway Golf Company (NYSE: ELY) has introduced the Great Big Bertha Epic, a driver that incorporates Callaway’s innovative new Jailbreak ball speed technology. Jailbreak changes the fundamental way the head behaves at impact to promote more distance for every type of player. The key structural components of a driver – crown, sole and face – deform at impact. Because they’re connected, they influence each other’s dynamics. Jailbreak incorporates two slender titanium bars positioned parallel to each other behind the face, connected to the crown and sole. The size, strength and position of each bar creates a new dynamic relationship between the crown, sole and face. The result is a profound change in how the head, as a whole, behaves at impact, resulting in more speed across a much larger area of the face. Epic’s clubhead consists of Callaway’s new aerospace-grade titanium Exo-cage outfitted with a crown and sole panels made of triaxial carbon, an extraordinarily light and strong composite material developed by Callaway. Nearly half of the head’s surface – 46 percent — consists of triaxial carbon, with the crown weighing just 9.7g and the sole just 5.8g. That’s the lightest crown of any Callaway driver currently on the market. Epic’s multi-material structure is incredibly light and strong, with high MOI and a low, deep- back CG that makes it ultra-easy to launch the ball on a high angle with low spin. an invaluable feature that allows golfers to quickly and easily adjust the club to fit their swing. Compared to previous Callaway drivers, Epic’s track has been redesigned and the sliding weight has been increased to 17 grams, both for good reason: to deliver a full 21 yards of shot-shape correction (a 22 percent increase compared to last season’s Great Big Bertha) to dial in straighter, more accurate flight while maintaining high MOI (or Moment of Inertia). Head speed gets an additional boost from Callaway’s proven Speed Step technology. Devised with the help of aerospace experts, the Speed Step, located on the crown, improves head aerodynamics for more speed and distance. Callaway engineers paid particular attention to the shape, aesthetics and acoustics to make Epic pleasing to the eye and the ear. The Tour-inspired shape is sleek, aerodynamic and confidence- inspiring. The triaxial carbon weave visible on the rear half of the crown, along with the vibrant green highlights, give Epic a pleasingly different appearance. GBB Epic is so-named because it legitimately represents an epic shift in the way the head and face behave to enhance power, spearheaded by Jailbreak ball speed technology and the clubhead’s innovative Exo-Cage/triaxial carbon construction. Any golfer seeking an extraordinarily long, accurate and easy-to-launch driver, from scratch players to high handicappers should find more speed, distance and accuracy with GBB Epic. GBB Epic driver availability begins at retailers nationwide and on CallawayGolf.com<http://CallawayGolf.com> January 27, 2017 at the new product introduction price of $499. Also announced today, Callaway Golf will bring a complementary Great Big Bertha Epic Sub Zero Driver, which marries tour performance characteristics with forgiveness in a true paradigm shift, and a full line of GBB Epic Woods. These clubs will also be available starting January 27, 2017. Please add me to email it so I can get the latest golf buzz news! J.B. Holmes’wins 2019 Genesis Open – What’s in the bag? Website produced by cmsloaded.com Enquire about yours!